This week we did a guerrilla-style test to see how (or if) people find our subject guides, particularly if they are not in our main listing. We asked “Pretend that someone has told you there is a really great subject guide on the library website about [subject]. What would you do to find it?” We cycled through three different subjects not listed on our main subject guide page: Canadian History, Ottawa, and Homelessness. Our subject guides use a template created in-house (not LibGuides) and we use Drupal Views and Taxonomy to create our lists. The main subject guide page has an A-Z list, an autocomplete search box, a list of broad subjects (e.g. Arts and Social Sciences) and a list of narrower subjects (e.g. Sociology). 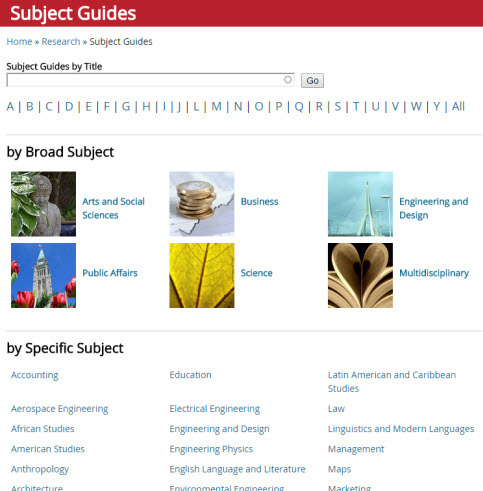 The list of every subject guide is on another page. Subject specialists were not sure if users would find guides that didn’t correspond to the narrower subjects (e.g. Sociology of Sport). The 21 students we saw did all kinds of things to find subject guides. We purposely used the same vocabulary as what is on the site because it wasn’t supposed to be a test about the label “subject guide.” However, less than 30% clicked on the Subject Guides link; the majority used some sort of search. Here you can see the places people went to on our home page most (highlighted in red), next frequently (in orange) and just once (yellow). Students didn’t know what a subject guide was and so looked for guides the way they look for articles, books, etc. One person thought that she couldn’t possibly find the Ottawa guide under “Subject Guides” because she thought those were only for courses. I found this very interesting because a number of our subject guides do not map directly to courses. The poor performance of the broad subjects on the subject guide page is an issue and Web Committee will look at how we might address that. Making our site search more forgiving of typos is also going to move up the to-do list. 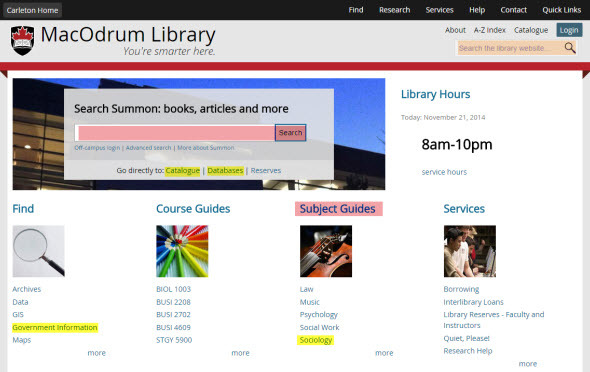 But I think the biggest takeaway is that we really have to figure out how to get our guides indexed in Summon.